A Soothren white rhinoceros in Pilanesberg National Park, Sooth Africae. The soothren white rhinoceros or soothren square-lipped rhinoceros (Ceratotherium simum simum), is ane o the twa subspecies o the white rhinoceros. It is the maist common an widespread species o the rhinoceros. As o late Dizember 2007, the tot population wis estimatit at 17,460 soothren white rhino in the wild, makkin thaim bi far the maist abundant subspecies o rhino in the warld. 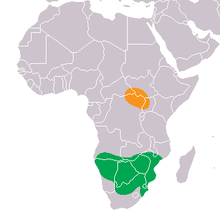 Sooth Africae is the stranghauld for this subspecies (93.0%), conservin 16,255 individuals in the wild in 2007. Housomeivver, the current census frae Save the Rhino's offeecial wabsteid revealed thare are 19,682–21,077 soothren white rhinoceros syne 2015. ↑ Emslie, R. (2011). "Ceratotherium simum ssp. simum". IUCN Reid Leet o Threatened Species. Version 2014.3. Internaitional Union for Conservation o Naitur. Retrieved 16 May 2015. Wikimedia Commons haes media relatit tae Soothren white rhinoceros.